Edith Elizabeth Appleton (‘Edie’ or ‘E’) was born on 9 June 1877 in Deal, Kent, 10th of 13 children. The family home was at 9 Golden Street and you can see more about it here. Ten year old Edie is on the left of the 1887 photo below. Her father was a Trinity Pilot. Edie trained at St Bartholomew’s Hospital between October 1900 and October 1904. We now have a copy of the Matron’s Register which shows Edie as an exemplary student – more information here. 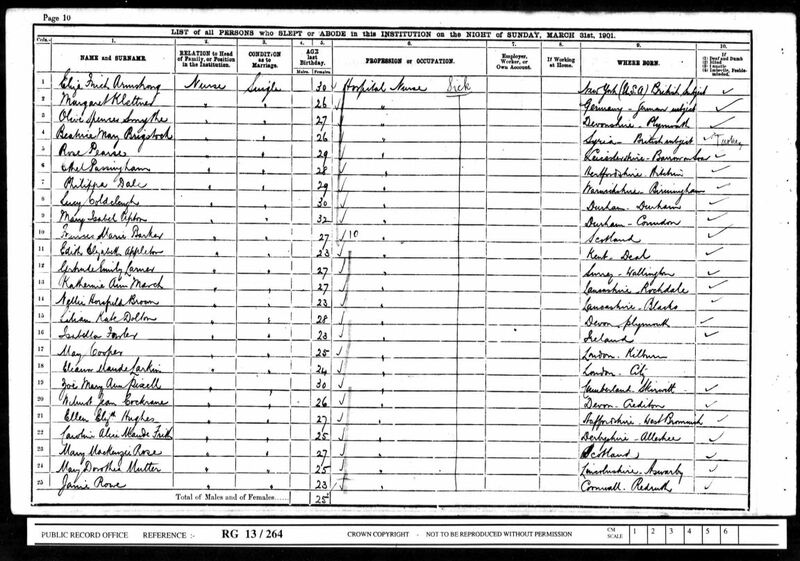 Click to see a copy of the 1901 census; Edie is listed as a resident of St. Bartholomew the Less, along with at least 200 other nurses. 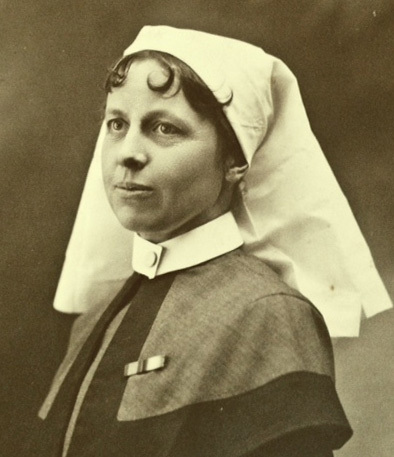 She worked in private nursing between 1905 and 1908, as a Health Visitor in 1911/12 and, just prior to the war, as a District Nurse at Crediton in Devon. With WW1 looming, she joined the Civil Hospital Reserve which had been set up a few years earlier by the War Office to provide a list of those willing to serve should war occur. She joined for duty at Fort Pitt, Chatham on 16 September 1914 and we assume that, at some later point, she transferred to the Queen Alexandra’s Imperial Military Nursing Service. Click here for a most interesting article on ‘British Military Nurses and the Great War’ by Sue Light. In April 2009 we found three letters from Edie which shed new light on her subsequent movements. You can read these precious new finds here. In the first letter, we learn that on Friday 9 October 1914 Edie left Southampton and travelled, via Dungeness and Dover, arriving at Ostende at 3am on Sunday 10 October 1914. After a day or two in Ostende she sailed, she thought bound for Dover, but after anchoring off Dunkirk she arrived in Boulogne. 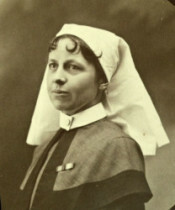 By 9 December 1914 she wrote from No 10 Stationary Hospital which, records show (http://www.1914-1918.net/hospitals.htm), was at St Omer from October 1914. Update 6 February 2012: an email from Bern in Australia has included some very useful links concerning No. 10 Stationary Hospital in St Omer. He says: “the building that houses 10 S.H. (although there were also wards in the adjoining church/chapel and it’s possible other buildings in that street were used too) can be seen at – http://throughtheselines.com.au/research/saint-omer#10SH. Photos here: http://www.flickr.com/photos/thrutheselines/sets/72157629165440251/detail/. Thanks Bern. A third letter, dated 23 February 1915, is from No 3 CCS (Casualty Clearing Station) which, according to recorded history, was at Hazebrouck at that time. No. 3 CCS was forced, by enemy action, to move to Poperinghe in April 1915 and then to Bailleul in May. In November 1915 she transferred to No. 1 General Hospital at Étretat and there followed several other postings throughout the war including to Abbeville, to 45 CCS at Achiet-le-Grand and to hospitals at Le Tréport and Boulogne. After the armistice in November 1918 she joined 42 Ambulance Train and, in February 1919 was appointed to the staff of Dame Maud McCarthy, Matron in Chief, at Boulogne (more about Dame Maud here). She was demobilised on 22 December 1919. Edie kept a handwritten diary throughout the war which details all the horrors, including the first use of poison gas, but also records how she spent her time off duty including a number of drawings and many accounts of what life was like for nurses. Amongst her decorations were the Military OBE, the Royal Red Cross and the Belgian Queen Elisabeth medal. Information about Edie’s decorations can be seen here. After the war she worked at Bedford College in London and in 1923 she and an elder sister bought ‘Buddlebrook’ at Brighstone in the Isle of Wight; this house became the home centre of the Appleton family. Living there, as well as Edie, were her sisters, Lil and Minnie, and her brother, Fred, vicar of Brook and Mottistone. Click here for more photos of the family and of Buddlebrook. But clearly the Matron in Chief, who replied on 18 August, was persuasive and by 23 August Edie had agreed to join! (More about Dame Maud here). Sue Light has an interesting piece on the TFNS on her ‘This Intrepid Band’ blog; click here to read it. In 1926 she married Lt Cmdr John Bonsor Ledger. They had no children and he died in February 1936. Edie died in 1958. Times obituary 10 February 1958. In this photo below, dated 1887, Edie is on the left of the photo and next to her is Minnie. The back row are (L to R) Edward (‘Ted’), Lila (‘Lil’) and Mabel (‘Madge’). In the centre is father Edward with Sydney (‘Syd’) on his lap and mother Eliza with Alfred (‘Taff’) on her lap. The front row are (L to R) Walter (‘Bud’), Guy and Frederick (‘Fred’).